Spiders (or arachnids if you are being posh) provoke strong reactions in some. One of my brothers, who still considers himself tough (even though he's now over 40) will move astonishingly fast in the opposite direction when encountering such a beast - usually with the result that his teenage daughter has to wrestle the creature into submission. To be fair, I dislike all insects (and yes I know spiders aren't really Insects) with an equal vigor and only tolerate spiders because they eat flies and other insects (in fact they eat more insects than birds and bats combined). There is something quite creepy and alien about them, they have blue blood for christ sakes, and move in a skittish, sharp, sudden way. If you do have Arachnophobia and don't like to be terrified then I'd suggest turning away now and making a cuppa instead. Despite the info dump above I don't have Arachnophobia - or at least I didn't before reading The Hatching - I have handled spiders (and other insects) when needed but might think twice in the future. It all begins in deepest, darkest Peru as a bored tour guide shows a rich American and friends some jungle. The tour guide and friends are quickly dispatched by a rolling mass of black. Rich American narrowly misses the show by taking a timely call of nature. With everyone missing, instead of looking for his subordinates, he boards his private jet and doesn't die till his plane crashes over American soil (serves him right for not even bothering to report the missing people). The crash introduces us to FBI investigator Mike Rich who is asked by senior management to find out what happened. Meanwhile China "accidentally" drops a nuclear bomb on a remote province and unusual seismic patterns register in a Indian earthquake lab. The first Female President of the United States of America (this was written before Trumpocalypse) is summoned to an emergency briefing and a mysterious package from South America arrives at spider expert Melanie Guyer's Washington laboratory - a package with an unusual egg that appears to be hatching. The egg is said to be at least ten thousand years old. The story plays out as a thriller with horror elements and how you feel about spiders will determine just how horrific those elements are. Either way it's a suitably tense and dramatic affair. There have been comparisons made to the classic thriller Jurrassic Park (the book, not the film) but these similarities are skin deep at best - it's got a similar start with creepy things killing in a remote jungle and there is a similiar tone of voice but thats as far as it goes. The scope and story arc of The Hatching is far larger and has fewer pesky kids. Having said that as far as quality is concerned, The Hatching is on a par with anything the late Michael Crichton wrote. The prose is excellent, Ezekiel Boone (who also writes as Alexi Zentner) has a real talent for story telling and creating thrilling, dramatic moments. 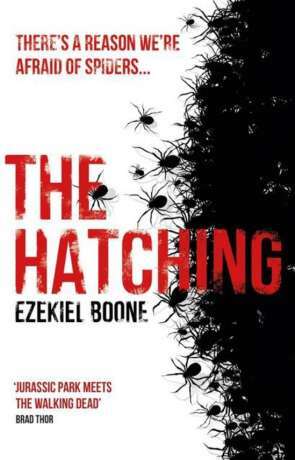 It is perhaps unsuprising that The Hatching has already been optioned for a film. The book is entertaining, it captures your attention right from the start and the plot moves forward consistently, not letting up and keeping reader glued to the pages. Characters are well written, although are predictably mostly American and are given brief backstory. It's quite a topical story, as we become more aware (or more concerned) about pandemics and other potentially global catastrophes. Global warming introduces us to defrosting bacteria that hasn't seen the light of day for tens or hundreds of centuries it seems quite conceivable that something could thaw (or hatch) that we are unprepared to deal with. I loved The Hatching, it's a clever idea well executed, a solid thriller and entertaining, tense story. I'm also glad to say it's just the start of the series and as I write this the sequel Skitter is due out now (expect a review to follow soon). Written on 21st April 2017 by Ant.